Sources in Rome said he was alluding to the breach of international law not only by the alleged use of chemical weapons by the Syrian forces but also by the missile attacks launched by the United States and its European allies early last Friday morning in response to that criminal act. They said that by circumventing the United Nations such attacks weaken international structures for peace and risk making the situation worse, not only in Syria but in the wider Middle East region. Pope Francis has repeatedly called for prayers for peace and urged political leaders and the international community to bring about a peace accord. He is profoundly concerned about the failure of the international community to bring an end to the seven-year war in Syria, as he made clear in his address to the ambassadors from more than 180 countries on Jan. 8 and more recently on Feb. 25 after a particularly bloody week in the conflict. According to the United Nations and other sources, an estimated 500,000 Syrians have been killed since the conflict began on March 15, 2011, in a country of around 18 million people; five million others have fled the country and over six million are internally displaced. The conflict has seen rebel forces, Kurdish forces, the Islamic State and other groups fighting against the regime of President Bashar al-Assad, which is being helped by Russia, Iran and others. In recent months, the Syrian forces of President Assad have seemed to be gaining the upper hand. The Vatican has confirmed that the pope and patriarch spoke by phone but did not reveal any details of the conversation or if some joint action will follow as a result. As someone who believes in the consistent -ethic-of-life, with the right to life of the innocent unborn being of paramount importance, I do believe that it's always immoral to kill civilians, and favor war only after diplomatic efforts have been exhausted. While I admire the convictions of pacifists, I believe that in limited circumstances war can be justified. Josh Robin reported in the Washington Post (April 15, 2018) that he believes unless Syrian President Assad is held accountable, his "slaughter of his own people in the cruelest and most illegal of ways is sure to continue apace." He believes that looking at history, Assad is " adept" at hiding chemical weapons and using them again when international attention fades. (Defense Secretary Matt is stated that the objective of the strike against Syria by an international force (our nation, France, and Britian) was to significantly degrade the Assad regime's chemical weapons capability and deter Assad from using them again, as he allegedly did last week). What are some of Assad's mass atrocities, war crimes, or crimes against humanity? It's disheartening that in the Post reporter's view, that "The clear message for Assad is that he is free to keep killing his people by any non-chemical means." The report went into a lengthy description o f Assad's brutality. However, several incidents illustrate why I believe that while diplomacy is ideally preferable to military action, that humanitarian assistance (if Assad in his utter disregard for human life will agree to it) must be supplemented by strong, multinational military action that doesn't deliberately target civilians. First, near the city of Douma, Assad has been running a torture and killing factory that Stephen Rapp, former State Department ambassador -at-large for war crimes called the worst "machinery of cruel death" since the Nazis. (Last year, our State Department confirmed the Syrian government was operating a crematorium for victims of Assad's brutality). As an aside that I believe is both important and sad, in another report in the Washington Post (April 15, 2018) according to a February poll released on Holocaust Remembrance Day, two-thirds of millennials can't identify what Auschwitz was. Worse still, 22% of millennials said that they haven't heard of the Holocaust or weren't sure if t hey've heard of it--twice the percentage of U. S. adults as a whole who śaid the same. I 'm sincerely not sure what's the saddest fact of life in the world today. Is It the violence of legal abortion, capital punishment, deaths from gun violence, human trafficking, deaths from poor health care or suicide, terrorism, neglect of the elderly, disabled, homeless, or mentally ill, war atrocities committed by Syria's Assad, or the lack of knowledge (to put it charitably) regarding the Nazi death camps that killed 6 million Jews as well as 5 million other innocent people, by young people in our nation?I Please read the entire article in the Washington Post(April 15, 2018). It's very disturbing, not entirely discouraging, and very illuminating regarding the ignorance of young people about the crimes of the Nazis. But back to the appalling crimes in Syria. The Post report by Josh Rogin, described a Syrian defector who produced convincing evidence of President Assad 's torture and murder of thousands of civilians in custody. He said that 150,000 Syrians are still imprisoned. As someone who's been a pen pal for years and sent occasional modest cash gifts to a man serving life in a Philadelphia, Pennsylvania prison, he's described to me the often inhumane environment and practices. So, I can only imagine what must be the incredidbly inhumane prison environment in a poor nation such as Syria. Although it's horrifying that thousands of innocent men, women and children have been killed by the government's artilley shelling, it's despicable that "Assad has been using a siege to starve civilians in East Ghouta for years." Finally, the report noted that Russia has been bombing hospitals and in other ways killing civilians. I regret that I can't share good, holy Pope Francis 'call for diplomacy by the United Nations (for instance) or the major nations involved in the war to bring about a peaceful resolution. Three recent Popes unlike several hundred prior Popes..... sought worldwide abolition of the death penalty....of course they also hate military actions per se. They are pacifists in late life testosterone ebbing ( JPII was not pacifist in the 80’s as to Poland wherein he stayed close to the usa....lol not to the UN) and Romans 13:4 by God is not pacifist. Dialogue is a dishonest prop they use...they don’t want any shooting after dialogue fails. Stop the pretense. 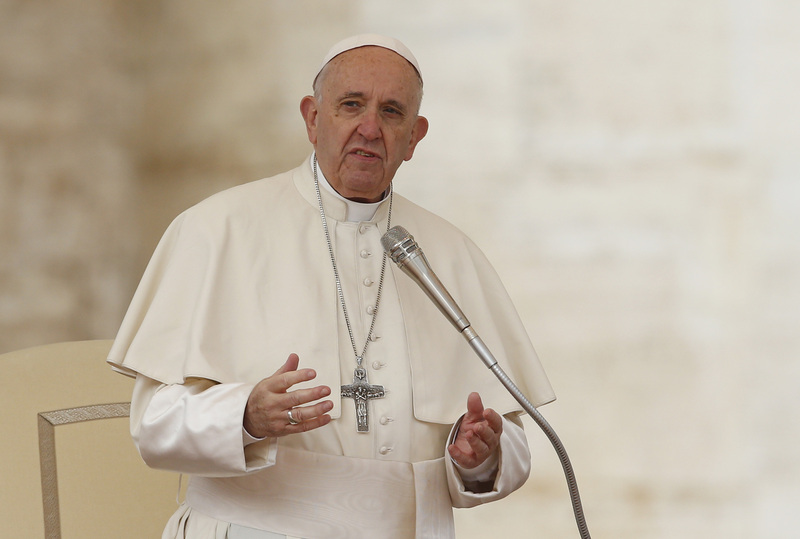 Pope Francis wanted ISIS stopped without bombing...fortunately the US ignored him. Three extremist Popes in a row. Lol....Benedict declares in Verbum Domini sect.42.... “ the prophets...challenged every form...of violence...individual and communal”. Elijah killed 450 Baal worshippers; Eliseus was mandated by God to slay any of the House of Ahab who escaped the prophet/ king Jehu; the prophet Samuel killed Agag whom Saul failed to kill as ordered by God; Jeremiah in 48:10 tells the Chaldeans they are cursed if they do not slay the Moabites as ordered by God. Can we possibly get Popes who don’t fake their knowledge of the old testament in their efforts to remake the prophets as Bob Dylan and Phil Ochs and Ghandi. Who are the "sources" in Rome that tell us that the Pope is alluding to a need for the United Nations to intervene in Syria? From what I read, the Pope appealed to "all those with political responsibility" to promote peace. Contrary to his usual approach of taking a political side, the Pope's call for peace - without arguing how- is precisely how he should be opining in these situations. Creating peace is a complex matter in which the Pope lacks expertise. His job is essentially to convert hearts and minds. The sources in Rome should be quiet. How is destroying chemical weapons in a Nation whose people have been the recipients of the employment of those chemical weapons, "brutal aggression"? Surely if we respect the Sanctity of human life, we must protect human life from those who desire to do harm. What is needed is a Miracle, and every Miracle requires an Act of Faith. Our Lady of Fatima, Destroyer of all Heresy, whose Fiat affirmed that it is Through, With, and In Christ, In The Unity of The Holy Ghost (Filioque), that Holy Mother Church exists, Hear Our Prayers! True Peace can only be found in communion with Christ.